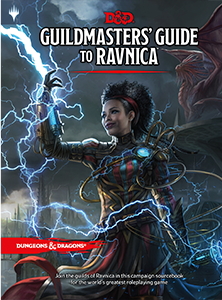 Guildmaster’s Guide to Ravnica is an epic fantasy supplement for Dungeons & Dragons, written by James Wyatt, Jeremy Crawford, Ari Levitch, Ben Petrisor, Mike Mearls, Robert J. Schwalb, and Chris Tulach and published by Wizards of the Coast. Like many of the folks I game with, my first experience with Magic the Gathering (MTG) was in high school. I was first introduced on a weekend camping trip with friends who wanted to learn a new game. I enjoyed the game so much, that on my way home from the trip, I promptly stopped at a local game store and purchased my first set of boosters. For the next few years, during breaks at school, a few of us would file into each other’s cars, head to the local game shop and split the cost of a booster box. We had so much fun opening packs in the car on our way back to class. To this day, I still enjoy opening that booster pack and looking at the art, even though I don’t really play as much anymore…time and trying to keep up with the evolving game mechanics just got away from me. When Wizards of the Coast announced they were building a campaign setting set in the MTG world of Ravnica, I was a little skeptic at first. I had seen attempts on Reddit of GM/DMs attempting to convert cards from the game’s playable races, spells, and creatures; however I wasn’t really sure how well it would translate. My mind was blocked from thinking creatively. Were the folks at Wizards just doing this as a cash grab, trying to pull in the MTG players with something new? Would Wizards show the same care and effort in building this setting as the others they have presented over the last few years? I can now say that I see the same touch that Wizards has taken with their other campaign offerings applied to Ravnica – which is a good thing. Guildmaster’s Guide to Ravnica offers the DM and players a great jumping off point into the setting of Ravnica. Ravnica itself is a giant city covering the whole of the known world (think Coruscant from Star Wars) and is ruled by ten guilds. You don’t need to know much of the MTG lore behind Ravnica in order to feel at home in the setting. The first two chapters give a great overview of the city, guilds, and races. When it comes time for character creation, it’s best to choose a guild. There’s a handy flow chart in the book to help you decide on the best guild that aligns with your character’s goals. In addition, each section of the guide, in regards to the guild, has its own background and describes opportunities to advance in rank among the guild. If the party ends up in different guilds, not a worry, the guide even sets you up for those instances noting that it is not rare to see guilds work together in alliances for a common goal. It’s not much different from your own homebrew campaign where each of your players have different agendas on why they adventure anyway…now you’re just associating a guild to their background. Let’s talk about the races though. First, the only known races from the Player’s Handbook are humans, elves, and a dash of half-elves, unless the other races are visiting from another plane. Just think of the uncomfortableness you can create if your PCs are a group of tieflings! However, what I was the most excited about was seeing the creatures from the Ravnica MTG set come to life. Centaurs, goblins, loxodons, minotaurs, simic hybrids, and vedalken. Now those that have played MTG are probably reciting the mana color as they read the previous races, I know I was. Each of the races have their unique traits spread out across the pages, bringing them to life. Ever wonder how a centaur PC would do with a climbing challenge? Hope you got a few strong party members that like to lift! The rest of the guide walks the DM through creating adventures in Ravnica – from organizations, treasure, monsters, and NPCs, the guide offers up so much detail that one can easily insert this setting into their own campaign. There is even an adventure that you can use to kick things off if you so choose. I was pleasantly pleased with how the Ravnica guide turned out and have already begun to brew up some ideas on how to incorporate the plane into my own homebrew campaign. Wouldn’t it be neat if the PCs came across a few lumbering loxodons looking for a relic lost to their plane of existence and the PCs have been requested to assist in its return? I know I’ve got a few PCs that would take them up on that offer.